Build your students’ critical thinking skills from the first days of school with my Solve It! Fall Sampler Pack ! Developing solid critical thinking and problem solving skills in the early grades is essential to support higher-level mathematics in the later ones. Problem solving and critical thinking activities can be infused in a variety of ways. The most important thing is to get our students thinking and communicating about their thinking as often as we can. This sampler pack provides seven different types of critical thinking and problem solving tasks that are sure to engage your students’ strategic thinking and problem solving skills. All of these tasks can be used as starters, included on a math menu, or included as a problem solving station option. 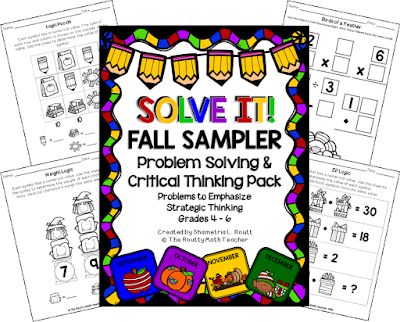 This sampler pack includes 7 problem solving, number clue tasks, and logic puzzles from the first four months of my “Solve It!” series. In addition, a solution guide is included for your convenience. Grab a free copy of my "Solve It! Fall Sampler" pack here or click the image above!